There is no greater evidence of a summer well-lived than a double-scoop of salted caramel with sprinkles held up against a totally Instagrammable backdrop. Until now. Now pictures of snow ice with boba, rolled ice cream, and pastel-colored mochi ice cream are filling up our feeds and making our mouths water. Traditional ice cream and gelato will never not be a crowd favorite, but this summer, people are also lining up in front of shops that serve up cold treats like the stuff you might find in Taiwan, Thailand, or Japan. Typically with vegan and gluten-free options, and featuring Asian flavors like pandan, green tea, lychee, plum wine, tamarind, and black sesame, alongside flavors like cookies and cream, strawberry cheesecake, and birthday cake, the Asian ice cream trend is hitting all the right notes right now. In Taiwan, they call it xue hua bing, which translates to “snow flower” ice. Exported out of Taipei in the 1990’s, snow ice only recently starting showing up stateside. Not to be confused with your typical shave ice or sno-cone, Taiwanese snow ice is shaved in such a way that it looks like a cup full of paper-thin ribbons. The ice itself has a delicate flavor and has a texture very similar to eating soft snow. Snow ice is made by freezing ice cream or flavored ice into cylindrical blocks. The block is placed into a machine that spins the cylinder and shaves off layers of thin ice. Then the shaved ice can be topped with sweetened condensed milk and any number of toppings, such as boba, gummy bears, chocolate sauce, or fresh fruit. Check out these hashtags to wet your whistle: #taiwaneseshavedice and #shavedsnow. Thai Rolled Ice Cream is wafer-thin ice cream that is rolled up with cookies, fruit, candy, or cereal, packed upright in a cup, and then topped with dessert sauce and whipped cream. It’s popular in Southeast Asian countries like Thailand, Malaysia, Cambodia, and the Philippines, where it is often sold by street vendors, and began showing up in the U.S. in the last couple of years. To make this Asian ice cream, a milk-based liquid is poured onto an extremely cold, round pan; extra ingredients are cut in with a couple of spatulas, the whole thing is spread out into a sheet, and then quickly scraped into tubes. Go here to see how they’re made. Warning: the process is entrancing. 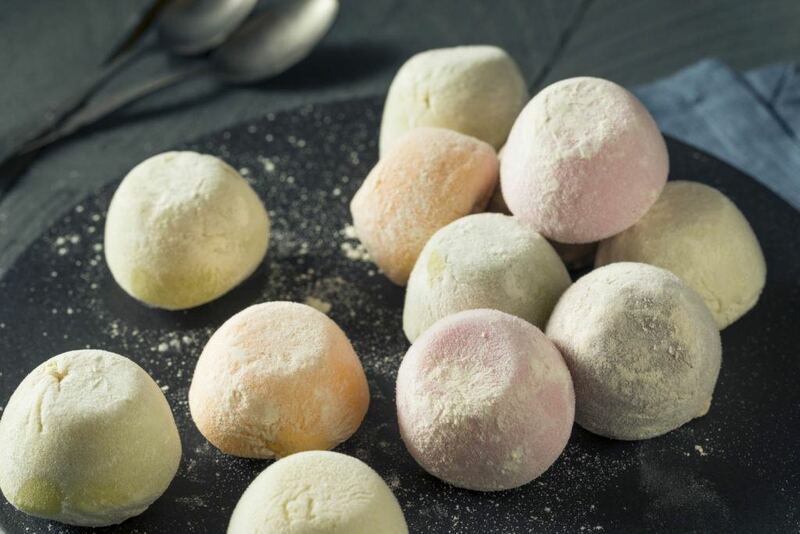 Japanese mochi (pronounced mo-chee) ice cream is a ball of ice cream encased in pillowy soft, rice paste mochi, and dusted with potato or corn starch. These adorable, two-bite, hand-held Japanese confections were invented by Japanese-American, Frances Hashimoto, in the 1980’s, and has become increasingly popular worldwide ever since. If you are one of the mochi-obsessed, you can find mochi ice cream in freezer cases in most grocery stores. Whole Foods even has stand-alone, self-serve mochi ice cream cases in their stores. Asian ice cream is definitely different, but it’s a refreshing change from the usual scoop. Have you tried it? Read more about ethnic trends here, and learn more about what’s coming up in the culinary world with the latest in FDR Food & Beverage Trends!